Back when I worked exclusively on my iPad, writing posts for Cult of Mac and everything related to that, I had a hell of a time getting some things done. It seemed like every tiny step needed to be researched before I could get anything done. In the end, I quit and went back to a split iPad/iMac setup, but not for the reasons you might think. Now, when I take my iPad out to work, like when we visit a trade show or I go traveling for a few days, I don’t even have to think about it. So much has changed in the last couple of years that the iPad really is as capable as a Mac for many jobs – and you don’t have to be a nerd to do it. Writing on the iPad always worked great – you just hook up a Bluetooth keyboard and type. The problem was everything else involved with blog posting (I’ll use blog posting as the example, but most of what I’m about to write applies to much more). Here’s how it used to work: I’d gather news in Mr Reader, the RSS app, and email any likely-looking stories to myself, whereupon a mail rule on my Mac would process it and add it to my Omnifocus, which would sync with my iPad (this improved when Omni added the mail-in feature that bypasses the Mac part). Then I’d start writing, opening the source article in Writing Kit, and using Writing Kit to post the articles too. Any photos I’d use in the story would have to be processed through the camera roll, resized in another app and – if I wanted to combine a couple of screenshots – in yet another app. As you can see, the main hurdle was working with pictures. While the iPad is pretty great for viewing and editing photos, it used to be that this editing wasn’t really about accurate pixel dimensions or working with multiple images. I actually had a python script, running inside Pythonista, that would combine images on the clipboard into a single picture. But wouldn’t it be easier to just insert a link to your pictures in any text editor? That’s the idea behind Shoots & Leaves, an app that lets you take a photo with your iPhone, and then uploads that photo to Dropbox. It then generates a link to that image and sends it to the app of your choice (or copies it to the clipboard). If you paste this link into a text article, you’ll have a picture right there. Shares does the same, only better. Shares uploads pictures to Flickr instead of Dropbox, but it also lets you choose pictures from your camera roll. Uploading camera snaps is handy but not much good for PR-supplied images. At Cult of Mac, we have a script that will take any Flickr images and copy them to our own servers, which is pretty neat. TextExpander is essential on the Mac, letting you type a few keystrokes and expanding them into whole paragraphs of text. I have templates set up for our standard review format, as well as to type my email address for me. 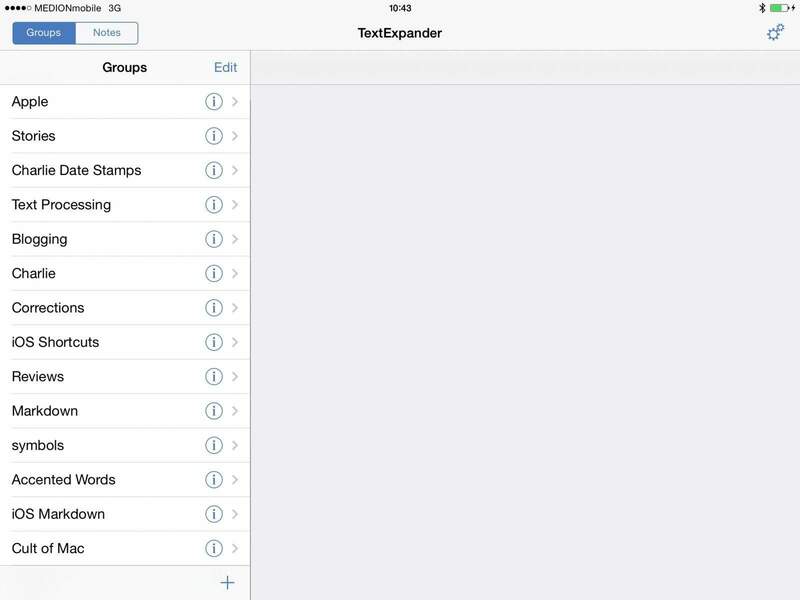 But Apple has all but crippled the iOS version of the app, which requires developers to add support for TextExpander in their own apps. iOS keyboard shortcuts go some way towards helping, but they lack essential features like hard returns in snippets. I have a snippet set up to type my address, but I have to manually add returns to get it on separate lines, every single time. Many apps are adding proper support for external keyboards. Byword, the Markdown writing app, can be used almost exclusively from the keyboard. With various combos letting you do things from bolding and italicising text, to navigating your list of files with search. iOS 7 added some extra keyboard controls too. In safari, for instance, you can hit ⌘T to open a new tab, ⌘R to reload and ⌘L to put the cursor up in the URL bar. These match the shortcuts used on OS X, making it very easy to remember them. I quit using the iPad for work becasue I was getting arm and shoulder pain from reaching up to touch the screen all day. Keyboard shortcuts would have done a lot to help. I’m not sure if iCloud is any more or less reliable, but it has worked its way into a lot more apps. If you have desktop and iOS versions of apps like PDFPen, Byword, and even Apple’s own iWork suite, you can switch seamlessly between your Mac and your iPad, and all your work will be just as you left it on the other machine. And apps like Smile’s PDFPen-compatible Scan+ app will even perform OCR (optical character recognition) on scanned pictures, extracting the text, and then syncing this with the the Mac version of PDFPen. In this case, the iOS version is superior to the desktop version. Automation on the iPad has gotten way better in just the last year. Thanks to inter-app URL schemes that let applications send information to each other, and then send a replay back the other way, it’s possible to get around the sandboxing model of iOS which adds security (good) but makes it hard for apps to share data (bad). Apps like Drafts and Launch Center Pro let you automate all kinds of tasks. Drafts, for example, can be used in conjunction with a bookmarklet in Mobile Safari to take a chunk of text highlighted on a web page and add it to the reminders app, complete with the URL of the original page. iOS 7 itself has made a big difference to working on the iPad. Control Center makes it a lot easier to tweak settings on the fly, without having to dig into the settings app. This doesn’t sound like much, but on older iPads, a trip to the settings app could use enough memory that iOS would force quit your previous app, requiring a relaunch and potential loss of work. 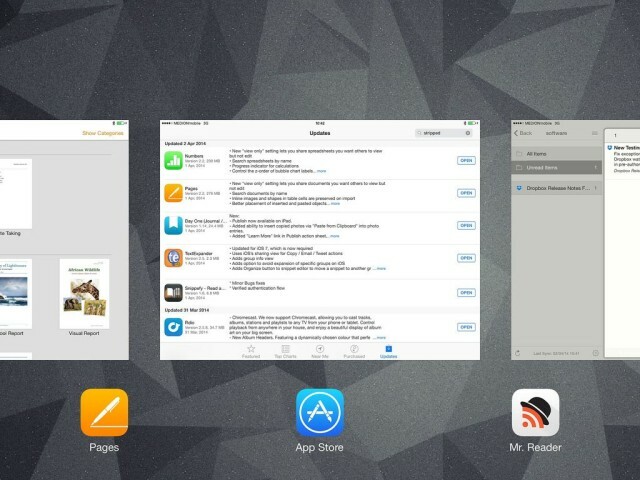 The iOS 7 app-switcher is also awesome for writing work. You can write in, say, Byword, then double tap the home button (or, even better, the home button on an external keyboard) and the previous app’s entire screen is shown in miniature. On a retina iPad this is enough to let you check spellings or words, or to reference photos, or anything else that requires a quick look at the screen. Then, another tap takes you straight back to your original app. Background updates are also handy. For instance, I use the Mr Reader RSS app a lot. And I mean a lot. My iPad has learned this and now refreshes my subscription in there background pretty much whenever I wake the iPad up. When I launch Mr Reader, the little indicator usually tells me my last sync was a couple of minutes ago. There’s still a long way to go. Better inter-app communication would solve many problems. Right now I have to save a photograph back to the Camera Roll after editing it with an app, and then I have to open that new picture in another app to make further changes. A service that let you keep shuffling the same image between apps until you’re done would be great. Readdle, has added something like this to its own apps. When you use the Documents app to organize and view your files, you can choose to send a file off to another Readdle app (a PDF view for example), edit it and send the edited version back to Documents, all without create multiple copies. A clipboard history would also be great. Copying and pasting is such a pain on iOS that it’d be a tremendous help if you could just copy multiple items to the clipboard, pop, pop, pop, and then paste them one at a time, in any order, into another app. And even better keyboard integration would also be neat. Like being able to ⌘-Tab between apps like you can on the Mac. Yes, it’s a little nerdy, but if you’re using a keyboard to work on your iPad I’d say that you already passed the nerd test some time ago. But things have evolved to the point that I can easily move between the two. I write and publish using Byword on both the iPad and the iMac. And somewhat ironically, my home internet connection just went down, so I have my iPad at my side for Hipchat and for fact-checking, and my powerful 27-inch iMac in front of me for writing. But if I go away for a week, I don’t take a MacBook. I take the iPad and a keyboard, and I don’t suffer at all. Gone are the days when working from an iPad meant hours or days of setup, testing to make sure everything would work in the field. Now it just works.